By William Mackay: Barry Hunter, the trainer for number #1 ranked IBF light welterweight contender Lamont Peterson (29-1-1, 15 KO’s), believes that Peterson has the skills to compensate for the speed of IBF/WBA light welterweight champion Amir Khan (26-1, 18 KO’s) in their fight on December 10th at the Convention Center, Washington, District of Columbia. Hunter described Khan’s tendency to throw fast punches as like a fastball pitcher in baseball, who if that’s all they’ve got in the way of pitches, hitters soon time the fastball and start hitting the ball out of the park. Hunter believes you’ve got to be able to change speed, and he doesn’t see that with Khan. Hunter is right about Khan. He seems to only throw fast punches and that’s about all he does. He mixes in some holding around the neck and shoving every once in awhile, but in the way of punches, it’s always fast shots. Marcos Maidana timed Khan in their fight last December, and staggered him badly with a right hand. Maidana continued to batter Khan after that, but was unable to take him out. Breidis Prescott, in his win over Khan, staggered Khan with a jab and then stretched him with a left hook to the head when Khan was in the process of throwing a hook of his own. Once Peterson times Khan’s punches, it’ll be all she wrote. He’ll be able to hit Khan no matter how fast Khan throws his punches, and we’ll likely see the fight turn from that point to Peterson’s favor. Khan really doesn’t seem to know how to vary the punching speed on his shots for some reason. He’s totally in love with his speed and has become very predictable with how he thows his shots. Peterson is going to time him after a couple of rounds, and we could see Khan take a real beating in this fight. 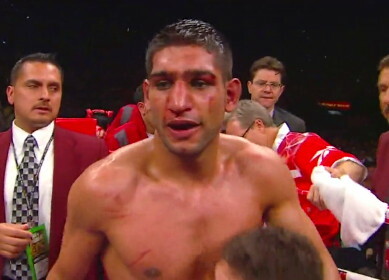 Maidana had Khan’s face resembling a house cat by the time the fight was over. I suspect Peterson will do the same unless Khan goes down early from one of Peterson’s well timed shots.